This book was sent to me for free. This book was sent to me by the author. This book was sent to me in exchange for an honest review. Thankfully, she's got other things to deal with, like trying to convince Joshua that New Orleans has a serial killer who is preying on other angel potentials like herself. Angel must quickly learn that when keeping someone safe, doing the right thing is not always the easiest, especially when you've got an archangel looking over your shoulder. Review: I would like to thank the author for sending me a signed copy of this book along with a signed bookmark. I will have to buy the rest of the series to have the complete set on my shelves. Originally I was unsure that I would like this book but wanted the rest of the books just so I had the full set. However, it turns out that I actually loved this book and cannot wait to own and read the rest of the series. When this book was offered to me I read the synopsis and decided that it might be an interesting read but I did not realise just how interesting it would be. 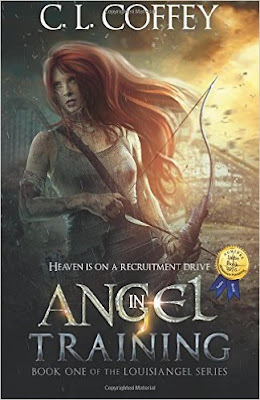 This book is action packed and keeps the reader on the edge of their seats wondering who the killer is and if Angel will ever earn her wings. I found myself lost between the pages of this book for hours at a time. Angel In Training ends on quite a cliffhanger that made me wish I could jump straight into the second book in the series. I cannot wait to own the rest of the series and find out what happens with Angel and the other potentials along with the fight that the angels are preparing for. I would highly recommend this book to anyone who enjoys young adult and paranormal novels. This book will have a permanent place on my shelves and surely be joined by the rest of the series and other books by C.L. Coffey.